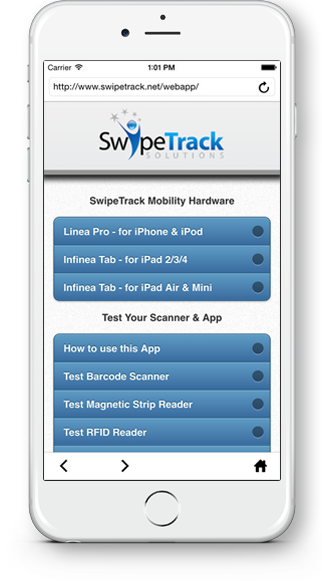 The SwipeTrack iOS Browser is the only fully-featured iOS application built specifically for integration of commercial grade hardware (like the Linea Pro, Infinea Tab, P25i Bluetooth Printer, and CHS Bluetooth Handheld Scanners) into custom web applications. The application works as a secure and stable “wrapper” for your web application, making your custom business application feel like a native iOS application. The SwipeTrack browser works by converting the “raw” barcode images and magnetic card data into easily readable data and then passing that data to your web application. The browser can also take “raw” html (including CSS styling) and convert it to a printable receipt for printers. The SwipeTrack browser is built with businesses in mind. Used worldwide by distribution centers, museum collections, in-house ticketing applications, car rental agencies and large political campaigns, and non-profits (to name a few) the browser is packed with features that allow you to leverage the full power of hardware integration. Adding support to your web application is easy and if you ever run into any trouble our helpful support team is standing by to assist with any issues you may have. Our easy to use and well documented Application Programming Interface (API) can get you smoothly integrated and up and running in no time. In fact, you can use our “direct method” scanning and scan barcodes directly into form fields of websites without any code integration at all. Using our application “callback,” your application can control specific features of the app, including setting the homepage, displaying and hiding the address and navigation bars, playing integrated sounds, and even firing the barcode scanning engine. With over 30 hardware integrations, the SwipeTrack Browser works in a variety of different environments. Forgot your scanner in the warehouse but need to scan a barcode now? That’s not a problem with SwipeTrack’s built-in camera scanner. 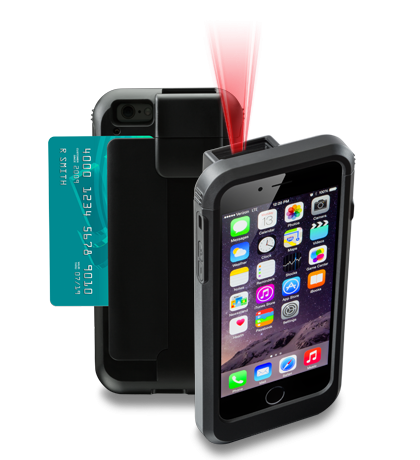 Using the devices on-board camera you can scan barcodes & credit cards the same way you would with your hardware based scanner. No need for extra code, the camera scanning feature uses the same code as the hardware scanners allowing for simple integration. The SwipeTrack Browser (and white-label variations of it) is used worldwide in nearly every industry. With over 80,000 worldwide downloads, the application’s flexibility and advanced feature integration have allowed it to become the #1 hardware integration application in the Apple App Store. The SwipeTrack browser has been rigorously tested by hundreds of companies worldwide and has undergone PCI testing within the scope of numerous applications. Our team is constantly monitoring any crash reports we receive and we proactively issue immediate updates to correct any problems. The last thing you need is your application crashing in the middle of a transaction, and we have gone to great lengths to insure that it will never happen. Our knowledgeable support team is available to help you with any issues you encounter. Are we missing a feature you need? Let us know and we will gladly work it into our next release. We started out with a simple web-wrapper application and now we have a feature packed business hardware integration application, all thanks to feature requests from our customers. We are constantly improving our applications - let us know so we can evaluate it.